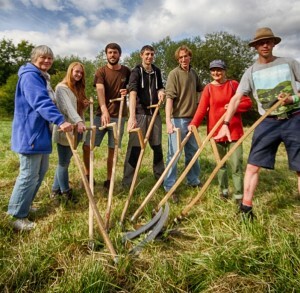 Meadow Keepers is the nickname of our Scything for Grassland Management Project, launched in June 2017,which has been supported by a grant from the Heritage Lottery Fund. Thanks to National Lottery players this 2-year project is helping to improve the management and subsequently the condition of 170 acres of grassland habitat at 15 green space sites across the city. Grasslands are important for wildlife and biodiversity – we are keen to keep them buzzing in York! As well as teaching the heritage and volunteer friendly skill of scything as a flexible grassland management tool, we have teamed up with Ptyxis Ecology to deliver training on monitoring grasslands species to help inform future management. We are focusing on scything for practical grassland management to maximise the wildlife potential of grasslands while allowing a flexible and practical solution for volunteer groups. The project is developing a consistent approach to grassland management that focuses on improving wildlife value in line with York’s biodiversity targets.